It’s not often that a bank holiday Monday is combined with a decent weather forecast and glorious sunshine. The children were desperate to go to a beach and build sand castles. We usually head to Yorkshire’s east coast, choosing either Filey or Whitby, but wanted something different this time. 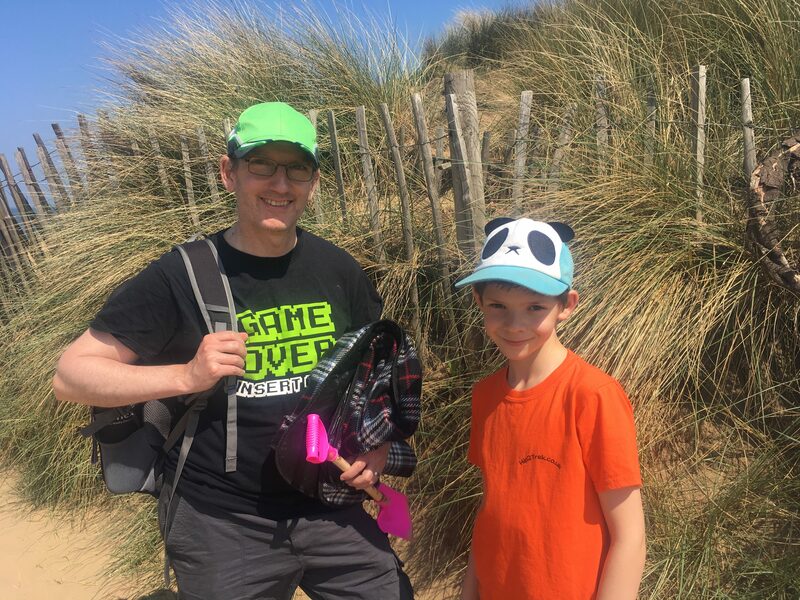 We’ve recently become National Trust members and so we went to the west coast of the country to try Formby beach, not far from Liverpool. I loved the sound of the dramatic sand dunes and coastal pine trees. We set off early surrounded by fog and the weather felt decidedly chilly, hmm was this a good day to be travelling for a few hours to then freeze on a beach?! Luckily the mist lifted, and the sun blazed down as we joined a queue to get into Formby itself. Everyone else had obviously the same idea and I was worried we wouldn’t get parked. A small road, through pine trees, leads into the car park near the beach with a few parking spaces near the toilets and walking trails. We got parked at the bottom closest to the beach but furthest away from the toilets. 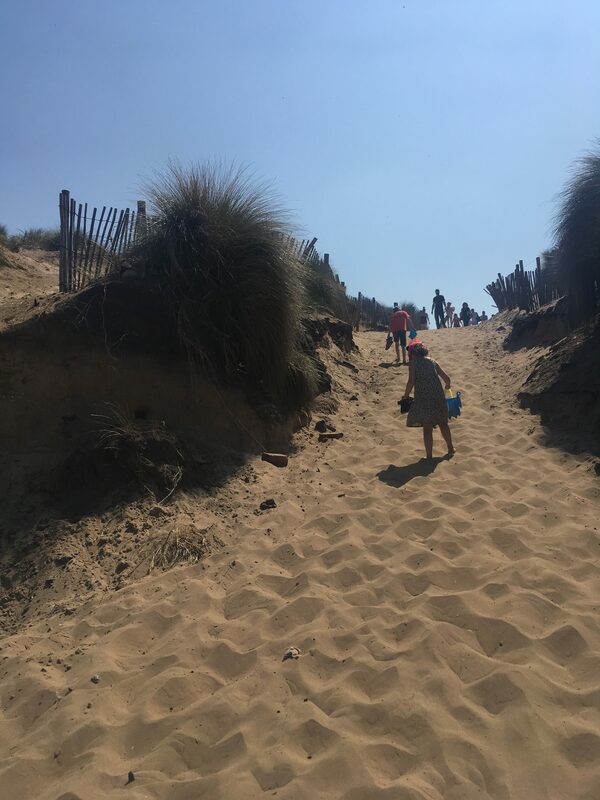 To reach the beach was down a steep sandy slope, through the sand dunes. It really is a glorious beach and families were dotted all over setting up for the day. I was amazed by how much stuff people were carrying, a few even wheeled along small suitcases! 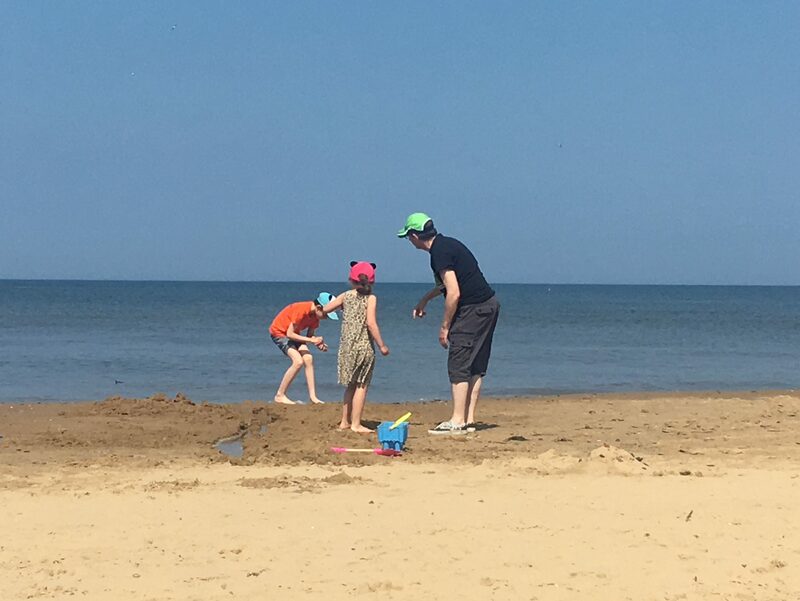 As we don’t go to the beach very often I felt quite under prepared, I had forgotten towels for the kids – because of course they want to get wet! And we could have done with an umbrella for some shade. The kids had a great time at the shore line, wave jumping which they love and making a moat channel to an as yet built sand castle. The heat however did get to me, don’t get me wrong I love a sunny day but hay fever and prickly heat were making me feel awful. My feet were itching for a walk in the pine trees. 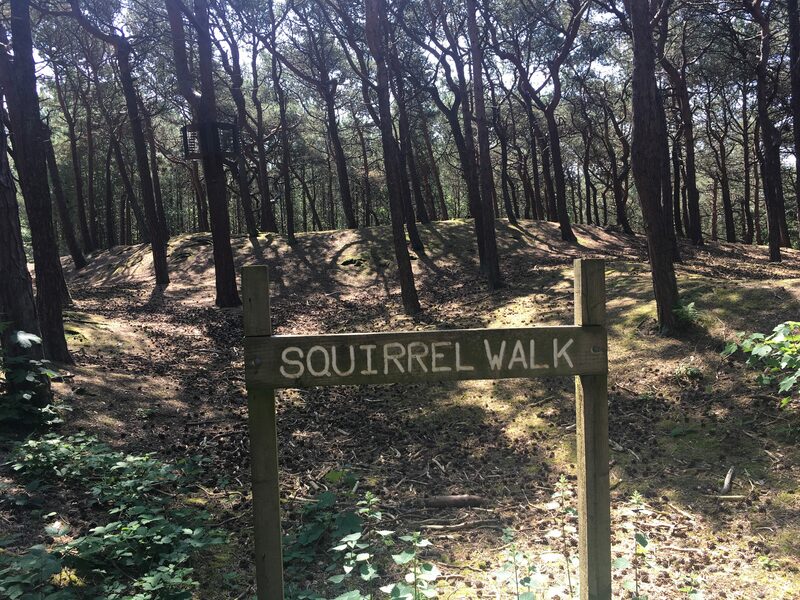 There are a few walking trails at Formby and we chose a tiny walk along the squirrel trail. Red squirrels can be found here, and as I’ve never seen one I was really excited that there were feeding areas in the trees, and we might spot a few having a snack. We walked the small circular trail and didn’t spot any until we were back at the start! There we were facing the feeder areas in the trees, being really still and quiet not seeing anything, and the squirrels were behind us all along running around in the other trees. I bet they were having a laugh at us! We heard a rustle and turned around in time to spot a few. So cute and a lot smaller than the grey’s we have visiting our garden. I loved their little tufty hair on their ears. Apologies I didn’t get a decent photo. I would have loved to have walked the other trails and discovered the asparagus fields or the prehistoric footprints on the beach, but I was feeling rotten, so we decided to leave that for another day. We had arrived at just the right time, as we left people were queuing to get in and it was a case of ‘one in – one out’. The children counted 117 cars in the queue! 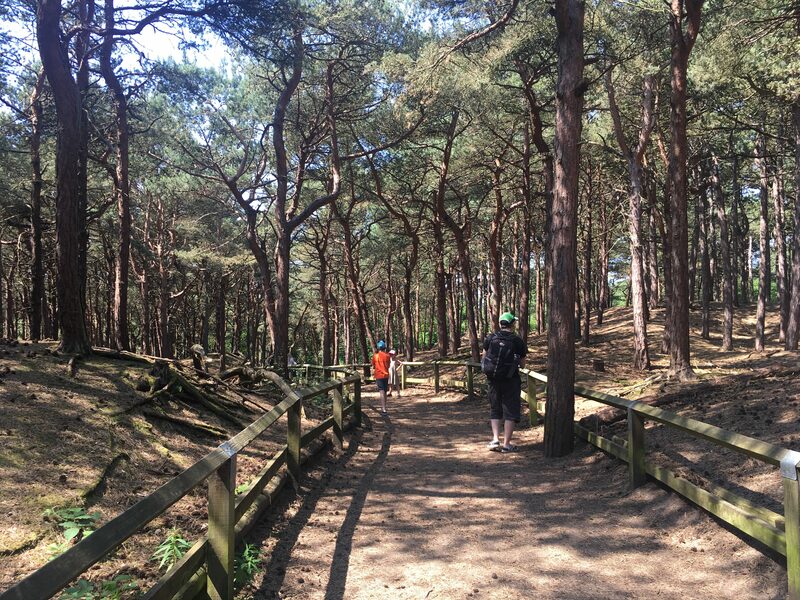 I think there is so much more of Formby for us to discover, we’ll just have to go back! 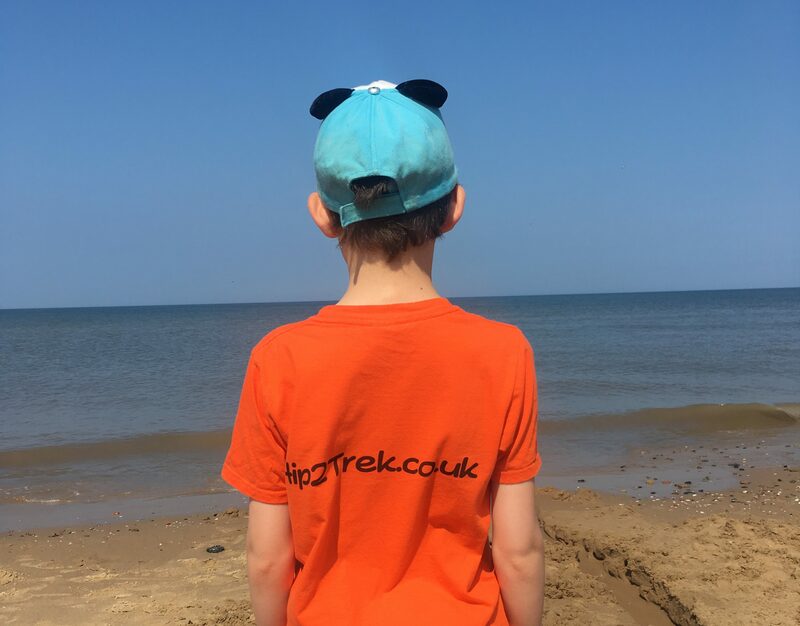 Hip2trek top tips – these are as much for me as you! Get there early! 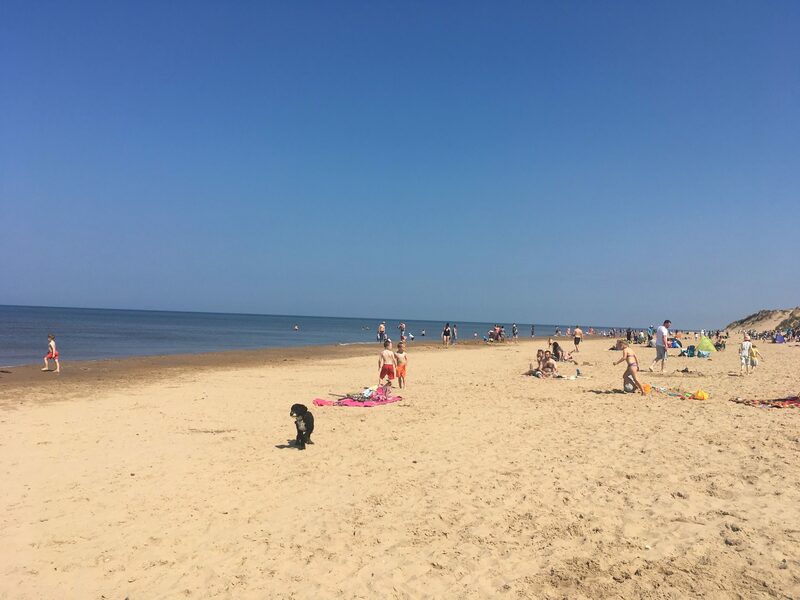 There are warnings on the website that the beach is very popular at weekends and bank holidays. There is Freshfield train station nearby if you can get there by public transport. There is an entrance fee, National Trust members get in free. There is no shade near the beach so take an umbrella or sunshade tent – obvious now! The children, no matter how careful they say they’ll be paddling in the sea, WILL get wet! Towels are a great idea. Take some money for a coffee or ice cream. There was an ice cream van there and a squirrel cabin was doing teas/coffees and the kids said could get hot dogs. The toilets are just on the way in after the entrance barrier, there are short stay toilet stop parking spaces which you can park in for 15 mins. Worth stopping if the car park is busy as it’s a bit of a trek back from the beach and back. 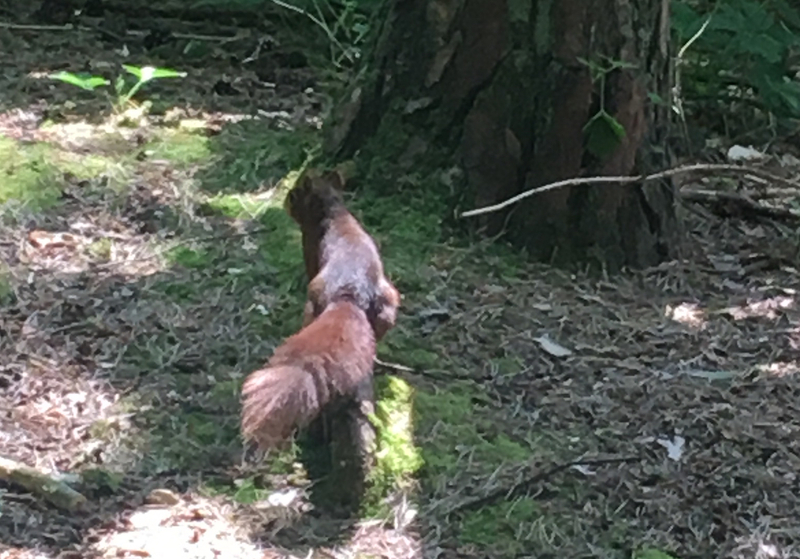 Keep your eyes peeled for red squirrels! Take a walk on one of the walking trails, discover the asparagus fields or walk up the beach and find the prehistoric footprints. 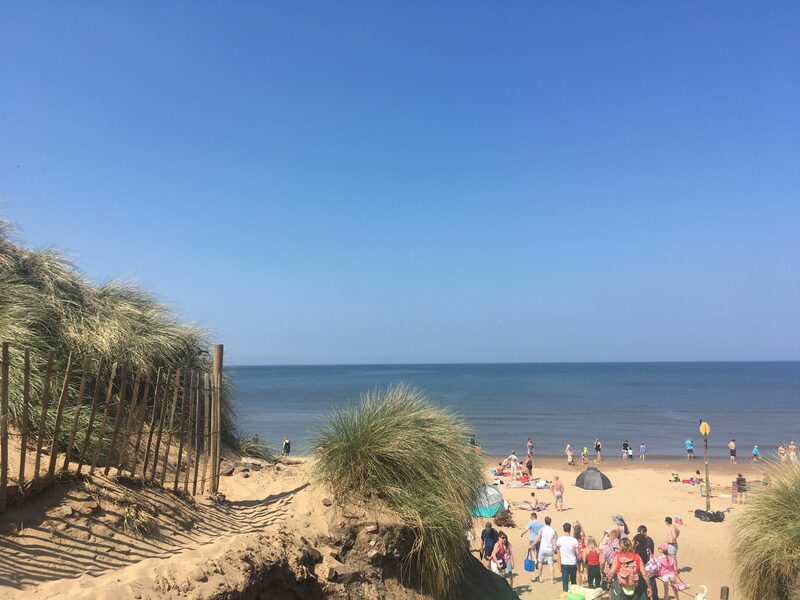 Have you visited Formby and got any tips for us? What do you take for a day on the beach? Let me know in the comments. I’ll have to go back and see the fossils! I know they’re so cute aren’t they! I was watched a lovely Super squirrel programme last night on BBC2 about them.